I don't remember seeing the events on local TV at that time, but I remember seeing this on a blog... I think you may have posted it some time ago (though I may be wrong). But this is very cool nonetheless! Hrm. I live at the wrong end of the state so I missed this. Signed by Tom Bradley and everything, wow. I think we ought to declare one of these days a *National* Ninja Turtle Day. If something as silly as "Talk Like A Pirate Day" has been so successful, why not? The TMNT also received the " KEY TO NYC" and a custom manhole commemorating them. .. i don't recall much else or if this was to promote the movie or what. Did an old blog post get reposted, along with the comments? Or am I loosing my mind? I don't remember seeing the events on local TV at that time, but I remember seeing this on a blog... I think you may have posted it some time ago (though I may be wrong). But this is very cool nonetheless!" 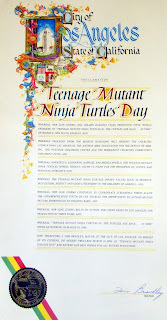 Well other than Talk Like a Pirate Day...there's also Be A Ninja Day on December 5th and World Turtle Day in May. So technically the TMNT have 2 holidays.